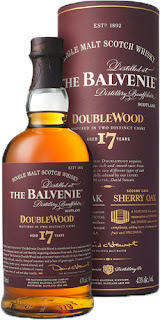 To eschew simile in favor of metaphor, The Balvenie Doublewood 17 Year Old is two eight and a half year-olds. This is no dig at its flavor profile: eight and half year olds are fun, and two of them will play together and have a good time. One seventeen year old will be sullen and will basically stay in his room, listening to emo music so that he can bemoan his miserable perception of his own existence. Just to himself. In other words, loads of entertainment. Meanwhile, the pair of eight and a half year olds are lively and enjoy exploring new things. Or at least this is what my friends who are not so child free as I tell me. This pair of eight-and-a-half-year-olds, let’s call them Vinnie and Woody. Yes, the second one his parents named after the Toy Story character. At least they picked the protagonist and not some bit character. At any rate, Vinnie and Woody begin with lemon halves hardened to coconut half hardness. Not as fragrant this way, but Vinnie has always had a thing about lemons, and his mom has found that he does better with them (winces less) when she lets them sit out and lose some of their sour. Woody plays along, but smells his more than anything else, and digs the bitter tinge of the rind. Then comes the persimmon gelato. It’s an amazing persimmon gelato, spewing clouds of glory (Wordsworth probably wouldn’t approve of that appropriation, but it’s lost on our boys). Vinnie and Woody are enjoying synaesthesia: the tang, the purplish red, and even the cold of their gelato all smell amazing. But they don’t recognize their experience as such, because they’re eight and half years old, and they have yet to distinguish clearly their senses anyway. Next, the shaved ice truck rings its bell in the street, and the boys run to the window, then to Vinnie’s mother, to plead their case. “We’re so thirsty,” they whine (or is it wine? ), pointing to their mouths. They receive a definitive no and retreat to the basement, where they play amongst the musty, empty wine casks strewn about down there. “Is this a muskrat cask?” Woody asks. “Muscatto,” Vinnie corrects, though that is also a guess on his part. He also guesses Sauvignon Blanc to be the words on the cask Woody moves to inspect next. “Did somebody use this barrel to store Gibson onions?” Woody asks. They look at each other unknowingly, as they’ve both just mouthed words they’ve heard their besotted parents use, despite the fact that they are much closer to on target than they realize. When they emerge from spending time in the basement, Vinnie’s mother tells them they smell differently now and should wash up. They make their way to the guest bathroom and can almost taste the scent of dahlias wafting from the small vase full of them on the back of the commode. They run their hands under the water, but then finish by trying to get a lather from the decorative soaps shaped like flowers and waxed to hold their shape. Thus, with the faintest hint of soap, they finish and wonder how they are supposed to dry their hands on the postage-stamp sized cotton towels there. Back on the living room floor, having just finished cleaning up, they ponder the afterglow of their exploits, when the distinct flavor of fiddleheads sautéeing in an iron skillet waft over them. Vinnie and Woodie look at each other and know that the fun will not end any time soon. The Balvenie Doublewood 17 is Lord of the Flies–Granted, it’s less transparent than The Giving Tree, but what isn’t? It’s a great commentary on human nature, wrapped in a riveting storyline and compelling characters. It’s a classic that works on multiple levels at once. Our thanks to Andy Weir and The Balvenie for the sample!